I’ve watched a bunch of Mythbusters episodes, although I couldn’t tell you what order they all came in. That’s one of the virtues of the series, that any given show can be watched in any order, since they stand alone. If you’re not familiar with the show, each installment takes on a few “myths”, although these days, it’s as likely to be a viral video as a classic urban myth. The team, with their special effects experience, builds something — a measurement apparatus, a fake house, a rebuilt car, a dummy equivalent to a person — to test whether an assumption is plausible, confirmed, or busted. Many times, things blow up, or firearms are involved. I was looking forward to the Mythbusters 10th Anniversary Collection because I loved the concept. Each of the five cast members — Adam Savage, Jamie Hyneman, Grant Imahara, Kari Byron, and Tory Belleci — picked ten favorite episodes, making for fifty shows to watch (on ten discs, out of 222 episodes through 2014). 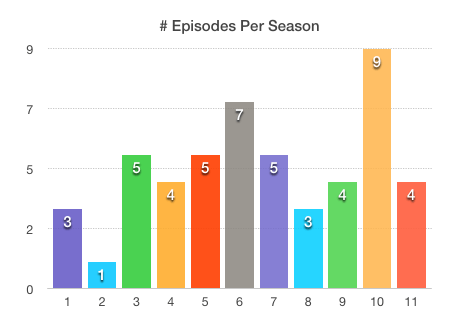 Inspired by the spirit of scientific exploration that drives the Mythbusters show, here’s a breakdown of how many episodes from each season are represented. The small showing for the first two years makes sense, since Grant, Tory, and Kari weren’t in place as a trio until season 3. All the Season 1 picks are from Adam. Season 10’s showing is helped by Tory picking four of those episodes, with Grant and Jamie each picking two.